Saturday is the anniversary of the Purchase of Alaska. And in Sitka, the site of the historic sale, locals make it known from the moment visitors step off the plane. This usually goes over well, but sometimes creates confusion. Sitka’s military past brushed elbows with present day security last Friday (10-10-14). At 11am, a TSA official called the police to report there was a man with a gun in the airport, but it wasn’t just any type of gun. “It was a replica Civil war era pistol in a closed leather holster,” said Betty Conklin. It turns out the owner, who wishes to remain anonymous, is part of a group of greeters for Alaska Day. Greeter 2: You’re getting off a plane. Greeter 1: Program of events for Alaska Day. Tonight’s the magic show. Centennial Hall. Stationed at the arrivals gate, the group greets visitors coming off the morning and evening flights into Sitka. All are dressed in 1867 era clothing. Betty Conklin organizes the group and said one gentleman in the group wore a replica of a Civil War officer’s uniform. Complete with wool trousers, white kid gloves, and that replica pistol. This alarmed a passenger, who tipped off TSA, who called the police. By the time the officer arrived, the greeters were gone. Conklin said the costumed officer was ultimately told to remove the pistol. She wished the situation had been dealt with more directly. Though the identity of the passenger is unknown, Rebecca Britton remembers being on that very same flight Friday morning. Britton said she didn’t notice a gun, amid all the bonnets and the hoop skirts. She came in from out of town to be a part of the celebrations in Sitka. Conklin, who is a jail officer at the Sitka Police Department, was sympathetic to passengers afraid of guns in the airport, replica or otherwise. But, she defended the history of the state and implored future visitors to respect it too. And a loud one, when military reenactors get to actually fire those guns, touching off black powder, during Sitka’s Alaska Day Parade on Saturday. 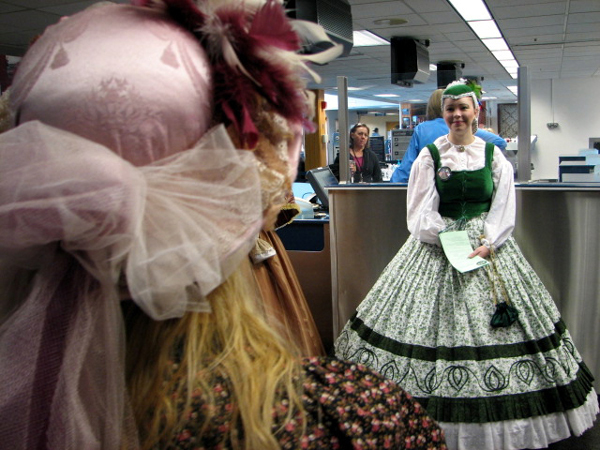 The Alaska Day greeters will be at the airport to greet the 10:40am flight and the 5:40pm now through Saturday morning.